Should Nifty Traders take cues from Baltic Dry Index? 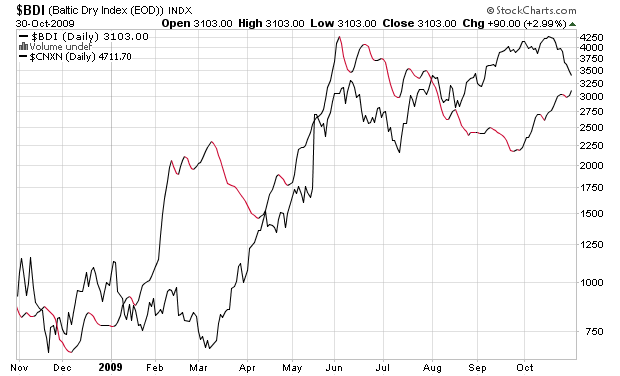 You are here: Home / Baltic Dry Index / Should Nifty Traders take cues from Baltic Dry Index? Does the Stock Market(Say Nifty) follows the Leading Indicator of Economy? We cant directly compare leading indicators with the index of the same period..
May be it would create fears among investors because during July-Aug market looks overbought and the PE ratio is above 20. Also Baltic dry index had crashed more than 50% from its high just leave the impression that market would crack any point of the time….. If you are a Nifty trader or an Investor then stop looking cues from BDI. Stop Reading External Factors and Start Reading Nifty! Let External Factors be External Factors! hi rajandran, do you know any site from where one can get eod values for batic dry index??thanks. “If you are a Nifty trader or an Investor then stop looking cues from BDI.